TEGUCIGALPA, Honduras (AP) — This week’s news that the Trump administration is ending Temporary Protected Status for 200,000 migrants from El Salvador is also rattling nerves in neighboring Honduras. Experts say that as in El Salvador, the return of tens of thousands of people — plus, potentially, an untold number of their U.S.-born children — threatens to exacerbate already-grave problems like high rates of murders and other crime, political instability, widespread poverty and income inequality. “The exit of so many compatriots from the United States would be a social bomb that will immediately explode in Honduras,” analyst Raul Pineda Alvarado told The Associated Press. Perhaps most immediately, there would be a hit to remittances, which typically account for about 20 percent of the country’s gross domestic product — though most of that is sent by Hondurans who would not be affected by cancellation of TPS. Billions of dollars sent home each year help households feed and clothe children, buy a car, build a modest home and keep the lights on. Those expenditures then filter out into the broader economy. Olga Martinez, a 42-year-old cleaning worker in Tegucigalpa, relies on the $150 a month she receives from two sons who are in the United States under the TPS program. It’s a significant sum in one of the hemisphere’s most impoverished countries, where about 65 percent of the population is poor and many make do on the equivalent of a dollar or two a day. The U.S. made TPS available for Hondurans after Hurricane Mitch ravaged the country in 1998, killing about 7,000 people and devastating the agricultural sector. The measure allows migrants to live and work in the United States legally. Like with other countries, it was by definition supposed to be temporary until conditions caused by the disaster improved back home. But over the years, successive U.S. administrations kept it in place, believing that other problems such as poverty, corruption and gang-driven violence would have made it difficult for the country to reabsorb those citizens. The Trump administration has made clear it is putting the emphasis back on the word “temporary” as it evaluates TPS, withdrawing it for some 46,000 Haitians and 2,500 Nicaraguans in November and now for the Salvadorans. Back in November it delayed a decision on Hondurans for six months, saying it needed more information. Homicide rates in Honduras and El Salvador have fallen significantly in the last year, though both are still among the highest in the world. Street gangs known as “maras” are ubiquitous and prey on small business owners and families through extortion. Honduras is already in the throes of political instability following a disputed November election in which President Juan Orlando Hernandez won a new term and his opponent alleged fraud. At least 17 people died last month in protests over the vote. Even Honduras’ school system could be sorely tested by an influx of children unaccustomed to learning in a Spanish-language setting, with scarce resources available to accommodate their needs. Allison said he expects not all 50,000 Honduran TPS recipients would return, with some likely remaining illegally and living on the margins of society, others making for Canada or another country and still others seeking residency through marriage or employer sponsorship. But Hernandez’s government clearly sees the El Salvador decision as a harbinger and is bracing for impact. “We must think about how we open the doors to them and how they can bring their goods and resources free of taxes to restart a life with greater facilities in Honduras,” he added. 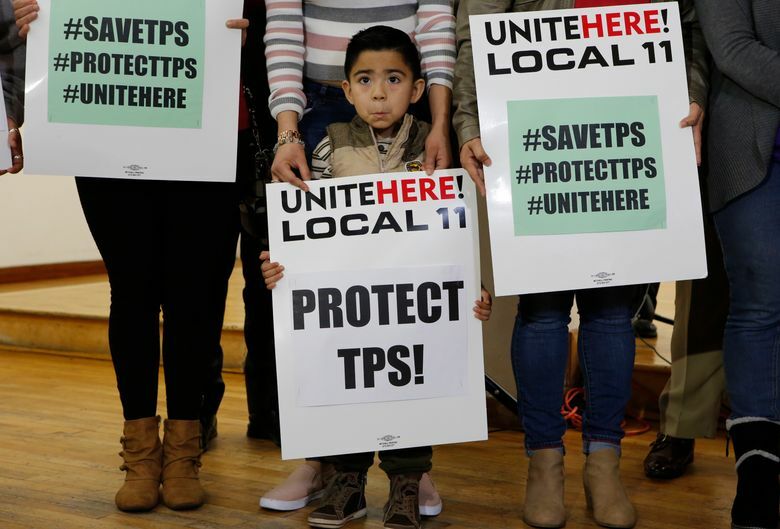 Like the Salvadorans covered by TPS, who were given a grace period through September 2019 before they must leave the United States, Honduras is now hoping for broader immigration legislation that could include relief for TPS recipients. Hernandez said his government is aggressively lobbying the Trump administration and U.S. lawmakers. “It is the U.S. Congress that is the key piece for the 56,690 Honduran TPS recipients, since they will decide how to enter into an immigration policy that would benefit Hondurans,” said Marlon Tabora, the country’s ambassador to Washington. On Wednesday, U.S. Rep. Mike Coffman, a Colorado Republican, introduced a bill that would end TPS while granting permanent residency to qualified enrollees of the program. It’s also possible that Honduras could win another 18-month extension out of political considerations. Last month Honduras was one of just nine countries to vote against a U.N. resolution condemning Washington’s decision to move its embassy in Israel to Jerusalem. If Hernandez, a conservative seen as a firm U.S. ally, were to make a similar decision to move his country’s embassy, as neighboring Guatemala has already done, it could curry further favor with the Trump administration. Associated Press writer Freddy Cuevas reported this story in Tegucigalpa and AP writer Peter Orsi reported from Mexico City.